The fabrication of low-dimensional nanomaterials based the ordered anodic aluminum oxide (AAO) template has attracted considerable interest because the template-based method can afford precise processes for controlling the morphologies of the nanostructured materials. 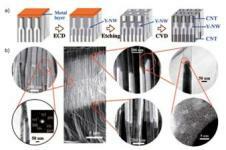 In this review, we present a brief description of the AAO template-based synthesis of oriented and hierarchical low-dimensional nanostructures for recent advances, including the diameter gradient and multi-level branched nanowires, nanotubes, nanorings, nanorods and so on. The fabrication of these nanostructures opens up new possible applications for low-dimensional nanomaterials in nanodevice applications in the near future.